« Troysus finished what he started. This is a loaded screencap right here. 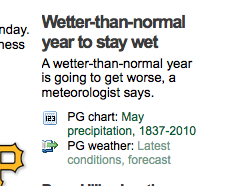 And why do they have the May precipitation chart going all the way back to 18freaking37. Is this “get worse” weather going to be so historically bad that they need to go that far back to find the last time that much rain fell in May in Pittsburgh? Yeah, I’m whining. But I can’t help it. One sunny day out of the week is three sunny days too few for May. Ah, hell. I’m going to click the link. It’s raining, it’s pouring, and it’s never going to end. At least not until July. OMG, YOU GUYS, I LOST ONE OF THE DINGOES! WATCH YOUR BABIES! I just saw 2 mallard ducks in my neighbor’s yard… I should mention I live nowhere near water. I have, this past spring, said/commented/blogged that don’t complain about the weather. Eff that noise. I’m complaining. I would like to actually formally lodge a complaint with Mother Nature or God or Gaia or the National Weather Service — whomever! — about this weather. It is too wet, it is too cold, and my kids and I are going stir crazy. If my 6yo daughter’s soccer association makes* me haul my 4yo and my baby to another freaking game at the swamp they are calling a soccer field, especially if it’s effing raining, I’m going to lodge a formal complaint with them, too. And there is no telling where I’m lodging these complaints either. Any nook or cranny I can reach, people. Any nook or cranny. $100 admission for a family of four, two of whom can’t ride anything because they’re ushering the offspring around Kiddieland, yet are forced to buy ride-all-day tickets? I’m not smiling when it starts raining, Jeff Filicko, I can tell you that much. Please no ark jokes. I can’t take anymore! The summer of 1990, I had just graduated high school and had my first paying job- minimum wage selling Hawaiian Shaved Ice, alternating between the Whitehall Plaza parking lot and Brentwood Pool. It rained so much in June that my bosses were losing all their money on my pithy wages and ice that never got used- we were shut down by July 4th weekend. There endeth my first job. This forecast reminds me of that summer. This makes me sad because I lost my job at the end of April, and get severance till the end of June- I was looking forward to spending the next 2 months on my front porch in the sun and poolside. Pfffft. God says “I mock you humans when you make plans such as these”. Well, at least we won’t have to hear the word “drought” for a while. Like, maybe, 2012 at the earliest. It’s something. Red pen mama, I’m with you. I generally love weather…all weather. I feel that it is among the biggest wastes of time you can find to complain about it. But…enough. This is depressing. It is the same day after day. Constantly raining. Always gray. I’m over it. I shouldn’t be fighting off Seasonal Affective Disorder symptoms in friggin’ May. Adding insult to injury, we live on top of one of the highest hills in the county, with a western view. Many evenings this spring, the sun will suddenly peek out as it sets to the west…giving us like 4 minutes of sunshine after a long, overcast rainy day. Gee…thanks. After three and half years spent living in Portland, OR where it basically rains from late October until the first week in June, I no longer let long stretches of rain in the Spring bother me. Daily rain in the Fall and Winter accompanied with temps in the 40s is worse (in my opinion) because the dampness and coldness sinks into your bones. I still laugh at the memory of co-workers running outside one day when the sun peaked out for ten minutes for the first time in weeks. This too shall pass. Anyone with any sense knows the world is ending on the 21st anyway. And if it doesn’t, y’all will be praying for rain in August, mark my words, children. That should be a show. I can hear my grass growing……. @ex-pat pittsburgh girl, I had a friend who moved from Pittsburgh to Portland OR. He called me one night, and without even saying hello, said, “It’s been raining for 22 days straight. Not sprinkling. Not misting. RAINING.” So, yes, perspective is worth having. @bucdaddy #9: I thought it was December 21. And in 2012. Are you using the Mayan Calendar end-of-days or is there an updated version somewhere in West-By-God? Just curious.